Climateclips.com is a collection of films and webisodes focusing on climate issues from a scientific perspective. Films and Webisodes are offered for viewing and streaming . 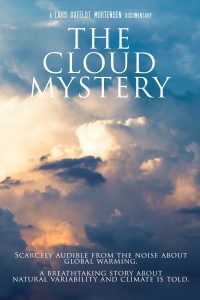 ”The Cloud Mystery” tells the story of how Danish scientist Henrik Svensmark found empirical evidence that Galactic comic rays from exploding stars and variations on the Sun are producing clouds in our atmosphere, and thereby recognized as a major climate driver on Earth. We follow Svensmark over the years when he is confronted with strong opposition from “settled science” – but also – when supported by fellow scientists that finds his ideas complementing in our understanding of past and present climate. (The film was released in 2008 but is still of current interest and discussion as it documents the scientific discoveries). ”The Cloud Factor” is a breaking news update. The last piece in the puzzle that finally nails the story told in ”The Cloud Mystery”. A breakthrough in the understanding of how cosmic rays from supernovas can influence Earths clouds and thereby climate. It gives an understanding of why changes caused by Solar activity or by super nova activity all are seen to change climate.